Battle of Napata - Confronting "The Alliance of Baal"
Things were just not going well for Pharaoh Meh-hotep II. Having barely secured his succession to the throne, the life giving Spring flooding of the Nile had failed to materialize threatening famine by the end of the year. The priests of Amun were being faint in their praise of his divinity, looking for a bigger cut of the annual collection of taxes and tithes. The Kingdom of Judea was being a pest as always; it seems they actually believed in their so called one true God and objected to his attempts to pressure them into allowing the erection of temples to some of the chief deities of Egypt - Amun, Ra, Set, and Ptah, on their lands. They would have to be dealt with later, as more immediate threats had developed. A rebellion by many of the always restive client sates of Egypt had sprung up. It was a motley collection including several tribes of the so-called Sea Peoples (the Peleset and Sardana), Nubians, Hittites and even Libyans, calling itself the "Alliance of Baal". Enemies to the East, West and South, unrest in Memphis and defiance from Karnak...what's a Pharaoh to do? Well, at least a nice war offered the prospect of uniting the various factions of the Kingdom! After authorizing his scribes to release some of the royal grain reserves to the populace, and participating in the usual rituals at the temples, Mehotep mustered his armies and resolved to met the Alliance head on, threatening their staging area at the walled city of Napata. The battle of Napata - Egyptians foreground, the Alliance of Baal in the distance. Another view of the battlefield just before the armies clashed; Pharaoh Mehotep II can be seen to the right near ground, leading the best of his chariotry. His scouts had determined that the enemy outnumbered his army, but that he had the advantage of more chariots than his opponents, and on this flank at least, better trained men and horses. Nearby was DIvision Amun (red), followed by Divisions Seti (blue), Ra (yellow), and Ptah (green), and then finally the other chariot wing of the Egyptian host. Mehotep was ready for battle, kopesh in hand. For their part, the Alliance of Baal, their leader's name having been lost to history, deployed with their outnumbered chariots evenly divided between the flanks, and with one Division each of Nubians and Sardana, Libyans and Hitties, Tehenu and Peleset, and Canaanites. Ra himself looks down upon the field as his golden chariot traverses the sky. ( I opened the hatch to basement to help it dry out from some minor wetness.) Also seen is John, a new player to us from the next town immediately to our South. He commanded the left half of the Baalites, while Barry had the right half. I played Mehotep II with the left half of the Egyptians, while Jared drove his chariot from Tarrytown, NY to command the right half of the Egyptians. Neither John nor Jared had played To the Strongest! before. Barry had played once or twice before and watched a number of games at Historicon. As seen above, the Egyptians "won the toss" and advanced, Jared's troops in particular making a swift advance using Group Moves the first 2 turns. Mehotep takes advantage of the superior number and quality of his chariots to threaten the Baalite right flank. Both sides loose 2 chariots, but that makes the imbalance worse, the Egytians then outnumbering the enemy chariots four to two. Over on the Egyptian right, with less maneuvering room, the Baalite flanks stayed secure. Division Amun, under strength and feeling threatened! Both armies had were 225 points strong. The other opposing infantry commands advanced upon one another as well. Baa-rry deploys some light infantry slingers to guard his flanks... just in case! John plays it close to the vest with his outnumbered chariots, but seizes control of the Oasis. A while later, Mehotep has picked off a third Baalite chariot - four to one are odd much to the liking of the mediocre leader, and the fairly open space on this flank also increases the odds of his divine personage surviving the battle! Slingers still protecting the right flank and rear of the Alliance's army. Jared's Divisions Ptah and Rah engage John's Hittites, Tehenu, and Peleset infantry. My Division Amun (red) is melting away under the hot African sun... down to a single unit. and that disordered (scarab marker). Incredibly, this lone unit of the Division, with its Heroic General, would survive the battle. My Division Seti (blue) unleashes a hail of arrows at the enemy for several turns in a row, doing no discernible damage bat all! Two units of Hittites, fearsome in melee but less stalwart under missile fire (no shields due to wielding 2 handed axes) threaten some weak archer units. If they can destroy the bowmen, the entire sector of the battle this side of the waddi will be devoid of Egyptian infantry, leaving Mehotep very isolated! Ra's eye view of the battle. Mehotep maneuvers his chariot to threaten the rear of the sole remaining enemy on this flank, and its general. "We'll enjoy this!" A tough slug fest in the center! Flanks, flanks.. that's a lot of exposed flanks! Having ridden down the last Baalite chariot on his flank, capturing their General in the process, Mehotep's chariots make themselves a thorough going nuisance, forcing almost an entire enemy Division to face to the right to protect themselves. Confused and desperate fighting continues in the center. Baa-rry's slingers manage to pick off one of Mehotep's chariots after many shots. The furious Pharaoh responds by charging them and crushing them beneath the wheels of his chariot... at least that's what the hieroglyphics on the stele will read! Continuing on, he reaches the gates of Napata itself. Their resolve shattered, the enemy breaks of and retreats (they were out of Victory Medals after losing 2 for the Chariot general and three for the camp). Mehotep II commissions an new bas relief at Thebes commemorating his victory, suitably exaggerating his personal prowess at every opportunity. Nothing less is expected of a God, after all! We had fun with this game, which allowed my new Tehenu and Peleset troops to take the field. Jared and I hope to run couple of games with To the Strongest with his middle school game club later this fall, and John is thinking of dusting off some Arthurian Roman-British and Pictish figures he has for use with the rules as well; what more can one ask as follow up from a game, but inspiring more games? The last (at least for now) of the Libyan and Philistine troops, followed by some group shots. Once again, I drew some simple ink pen decorations on their "towels"
Gotta make optimum use of those 30 figure bags of Old Glory troops, right? These guys are clearly followers of "Sheik Yerbuty"! I used yellow feathers on the headpieces for these guys for variety. In"To the Strongest", Javelinmen can move forward and shoot as a single activation, which is handy when you're advancing. I added some detailing on the torso armor using a brown ink pen. A Libyan General and a Hero. The general is placed upon a larger base, and the hero has flowers on the base to help distinguish them. and purple on the robe of the General. Philistine (Peleset) Hero and General. Same basing conventions as for the Libyans. Variations in their head dress and shields as well. 2 units each MI Bowmen and Javelin men. one unit each Light Infantry Bowmen and Javelinmen. plus 2 Generals and 2 Heroes; 60 figures in all. Tremble at our advance, you soft men of Egypt! 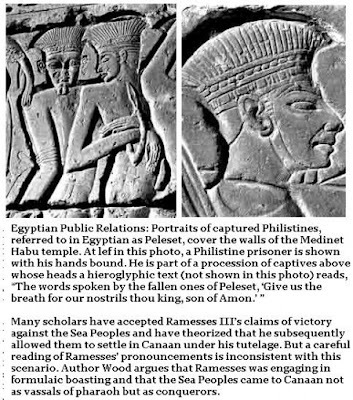 Identified with the "Philistines" of the Bible, these men are (perhaps) more properly referred to as Peleset, one of the "Sea Peoples". They characteristically wore felt headdresses with feather crests. Their short swords were used for thrusting..
Leather (?) torso armor was commonly worn, as seen above. Supposedly the pattern and colors of the headbands varied by tribe and unit. These troops carry a pair of javelins as well as their sword and round shield. I went with simple off white tunics with contrasting borders, but several illustrations show colored tunics with several contrasting bands. The Philistines were said to habitually raze any cities they conquered, leading the term to be associated with A lack of appreciation for culture. The Peleset are thought to have originated from Crete and Anatolia, although this is far from certain.